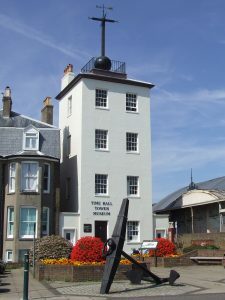 As part of the White Cliffs Walking Festival, the Deal Society are leading a walk on Sunday 28th August. A chance to learn about the role of the military in Walmer, from 55 BC to 1996, featuring some of the plaques and memorials to the people involved in that history. It will feature tales of some of the characters who helped shape the history of Deal and explain how a town with no natural harbour came to be one of the most important ports in the country. The walk will last about two hours and will be at an easy pace, flat and even, on urban paths. It will start at 10:30am outside the Timeball Tower, finishing at the start point which will be open for you to visit (normal admission charges apply).